I decided to use only three braces on the back, sometimes Hernandez and Aguado used four braces. Four braces tends to give the back a higher pitch than three braces. Yesterday was spent doing the final sanding on the interior, there are people who believe that the inside of a classical guitar should be immaculate. Those people need to look inside a guitar made by Antonio de Torres, Santos Hernandez, Domingo Esteso or any other guitar made by an Spanish master. 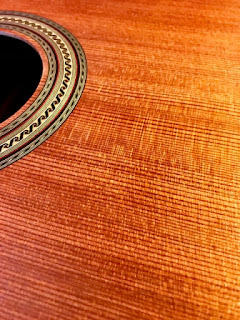 I spend at least one day cleaning, sanding, burnishing the inside of a guitar, it's as if the guitar is nickel and dime-ing you to death. 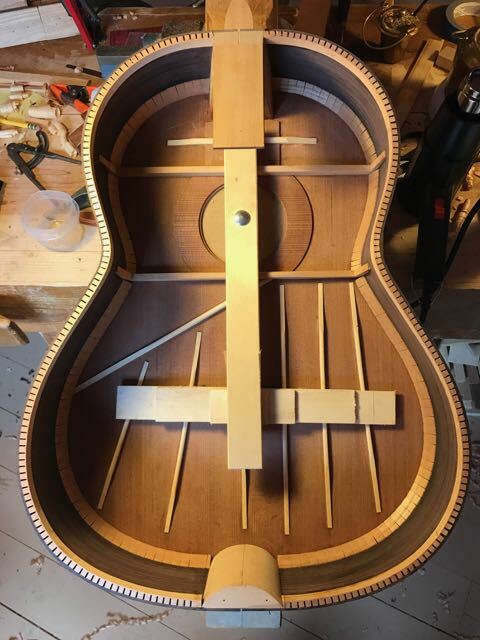 Glueing a guitar's back on is very nerve wracking for me, I want everything to be as perfect as possible, which means no glue drips and that all parts mate well. 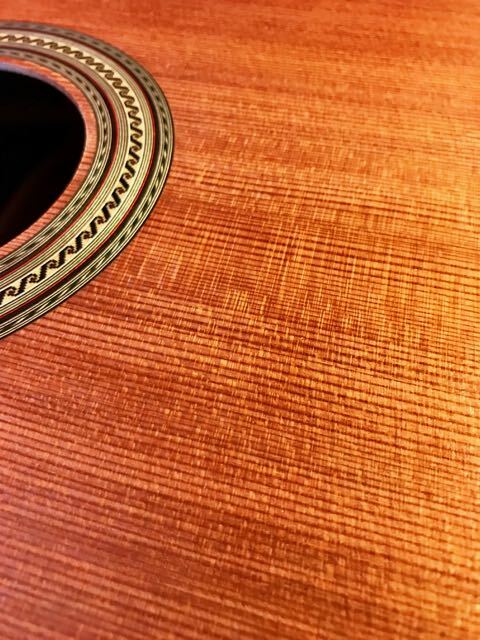 This redwood top has some gorgeous medullary rays! 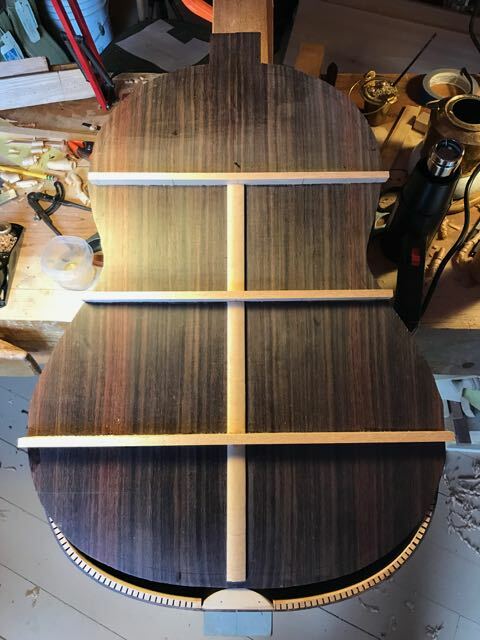 I have learned to put several wash coats of shellac on a guitar top before I start the binding process, it helps to protect the top from binding tape and glue. 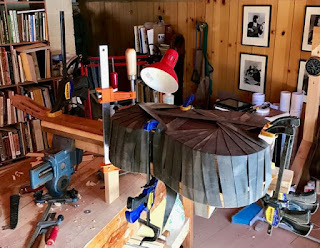 The shop is starting to look more like a guitar maker's shop with all these guitars hanging up waiting for work! 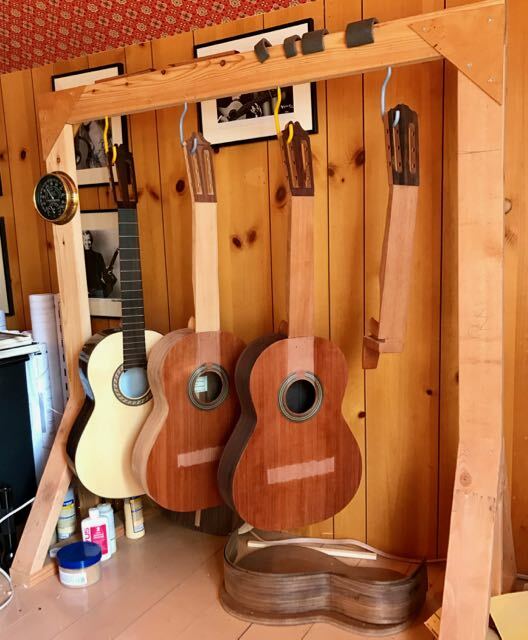 From left to right - Engelmann spruce/ziricote, redwood/black walnut, redwood/rosewood. The neck you see hanging on the rack is for a Port Orford cedar/rosewood guitar. Painstaking work, but worth it. The Redwood looks amazing!